New Mint vape juice from Logic Smoke is flying off our shelves. It is one of our top menthol tobacco flavors and is loved by many. It tastes similar to the popular Port brand of cigarettes in the green and white box and will help you make a smooth transition from smoking regular cigarettes to vaping. Pick up a bottle of Logic Smoke New Mint E-liquid and make your transition a breeze. 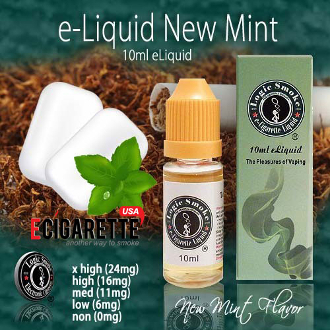 The 10ml bottle is a convenient and economical size for purchasing in quantity. Fill your clearomizer or other e juice atomizing device directly from the bottle or use it to refill your smaller travel-size e liquid bottles. You'll be ready and have liquid on-the-go at any time.